In keeping with the chill of winter, I’ve written up a simple pattern for a super cozy, super versatile scarf. It is worked almost entirely in the crocheted puff stitch. If you don’t know how to do the puff stitch, check out this fantastic video tutorial from Moogly. The same page also has a wonderful photo tutorial. To create a more lacy effect, as opposed to a really puff/cluster effect, the puff stitch in this pattern is not as bulky as in tutorials like the one from Moogly and others like it. Basically, you are going to do 4 double crochet stitches in one space but not finish them until the very end. Be sure to read the pattern all the way through and try the modified puff stitch as explained below. Yarn over and insert your hook into the next st. Yarn over and draw up one loop. Three loops will now be on the hook. Yarn over and insert your hook into the same st as before. Yarn over and draw up one more loop. There will now be five loops on the hook. Rnd 1) Ch 26 sts. Rnd 2) In third ch from hook, *work a mod-puff st and ch 1*. Repeat across. In the last space, do not work a mod-puff st; instead, work a dc. This will give each row an off-set, checkered look. Ch 3 and turn. Rnd 3-122) Repeat round 2, making sure to dc in the last space of each row, ch 3 and turn. 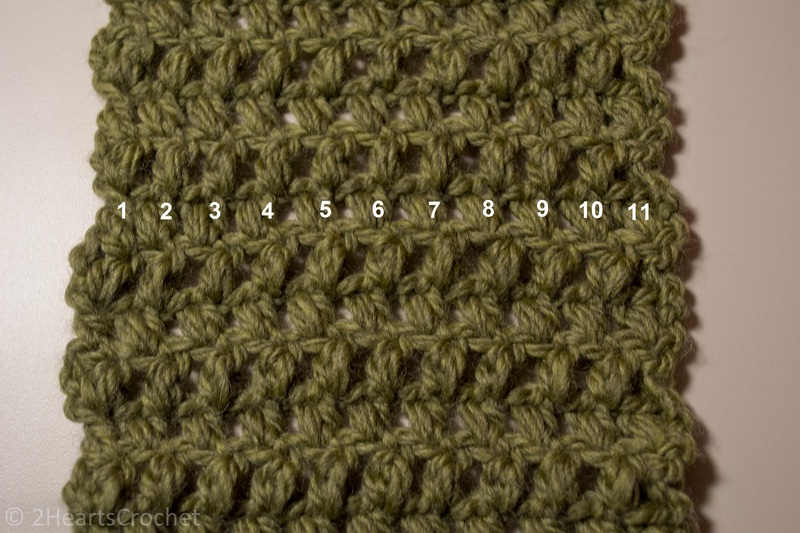 As you work, each row should contain 10 mod-puff sts and 1 dc st, resulting in an overall 11 non-chain stitches (there should be 10 ch sts per row excluding the turning chain sts). These 11 non-chain sts make it easy to keep count as you crochet. 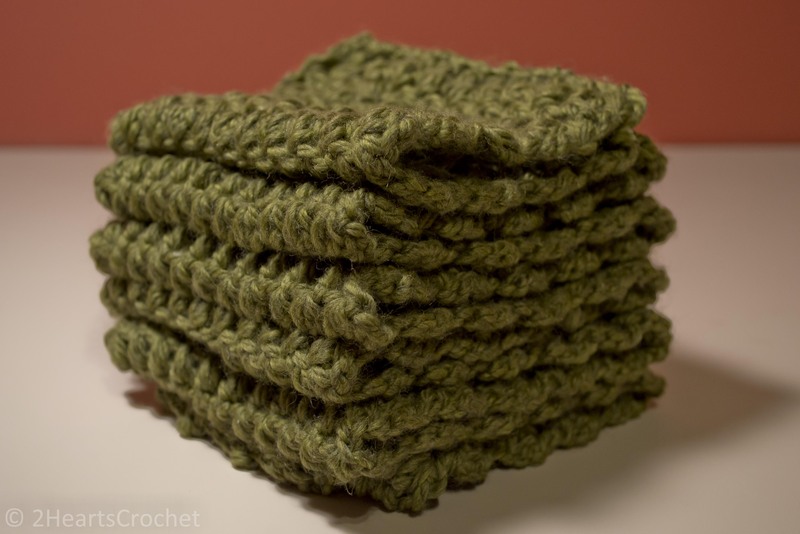 This pattern calls for 122 rounds simply because that’s how many I could make before I ran out of yarn. 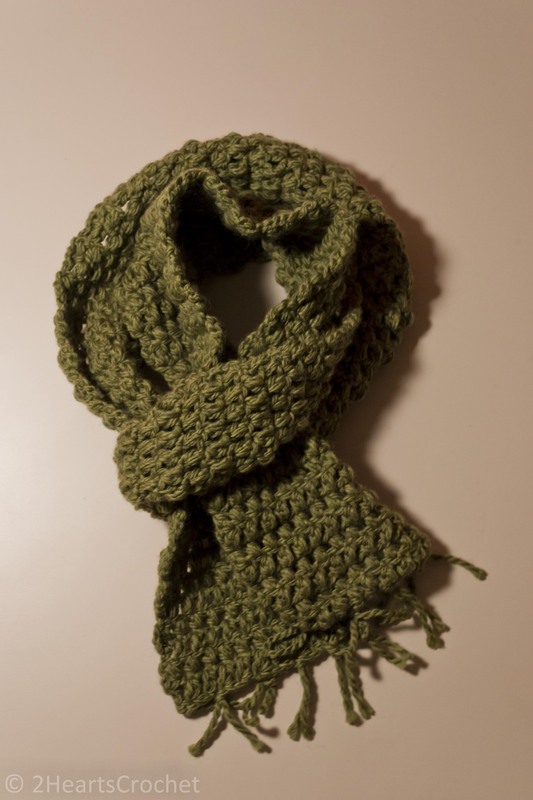 To make your scarf longer, simply keep adding rows until you are satisfied with the length! When you’re either close to running out of yarn or when you’re happy with the length of your scarf, cut up a handful of 3″ pieces of yarn. To make your fringe exactly as mine, cut twelve 3″ pieces of yarn, six pieces for each end. Fold a piece of yarn in half. Insert your hook into the st along the edge where you want the fringe to go. Place the folded “middle” bit of the piece of yarn on the hook. Draw up this loop through the st just enough to clear the hook from the rest of your work. wrap the two “end” pieces of the yarn around the hook (yarning over) and pull both ends through the loop already on your hook. This is kind of like doing a slip knot around the bottom rows of sts. Tighten the yarn and repeat across the row as I did for a total of 6 fringe pieces per end of the scarf–or, for a scarf with fuller fringe, pull several pieces of yarn through the same st with even more frequency! And there you have it! 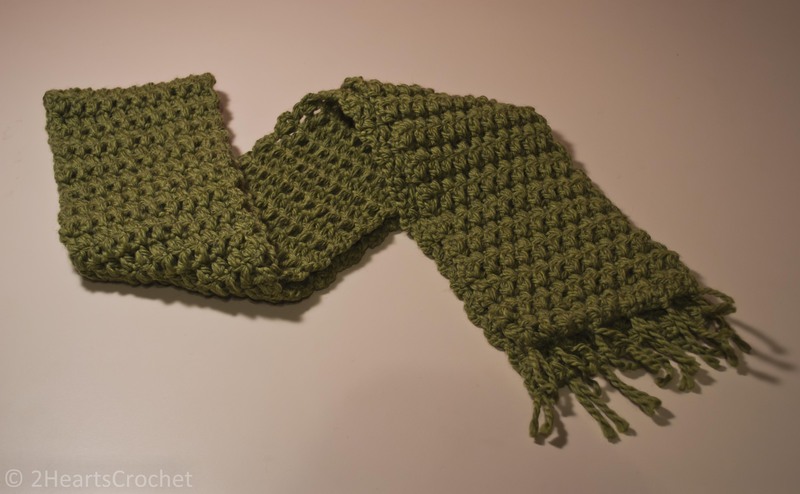 One very lovely, very cozy scarf! This would be fun to make in a nice self-striping yarn or in stripes of different colors! Please feel free to share pictures of your fantastic scarves–I would love to see all of your creative spins on this pattern!